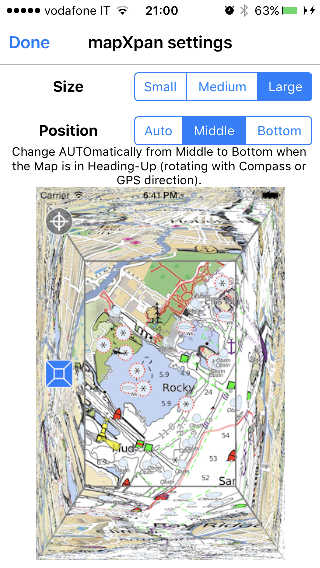 This application provides the user with an amazingly clear Nautical Chart using the full power of the Retina display, intuitive realistic symbols and colors. 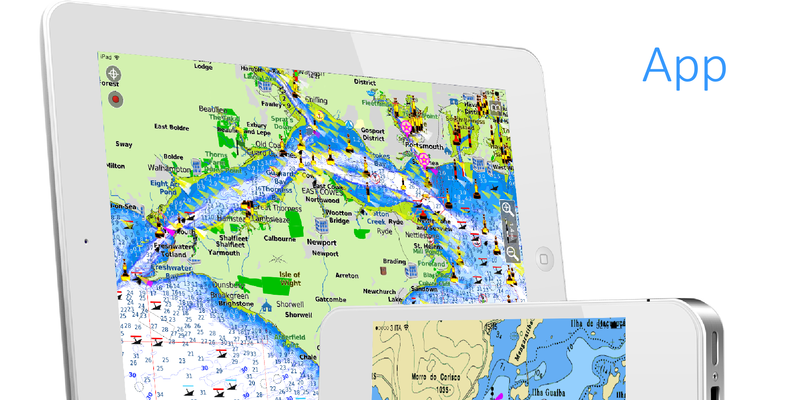 Aqua Map makes available its functionalities in a very simple and intuitive way, so that everyone can enjoy them with no need of wide experience in Marine navigation. Indeed most of the functions are accessible with simple gestures on the map, and all are clearly described in the Aqua Map Tutorial and Help. 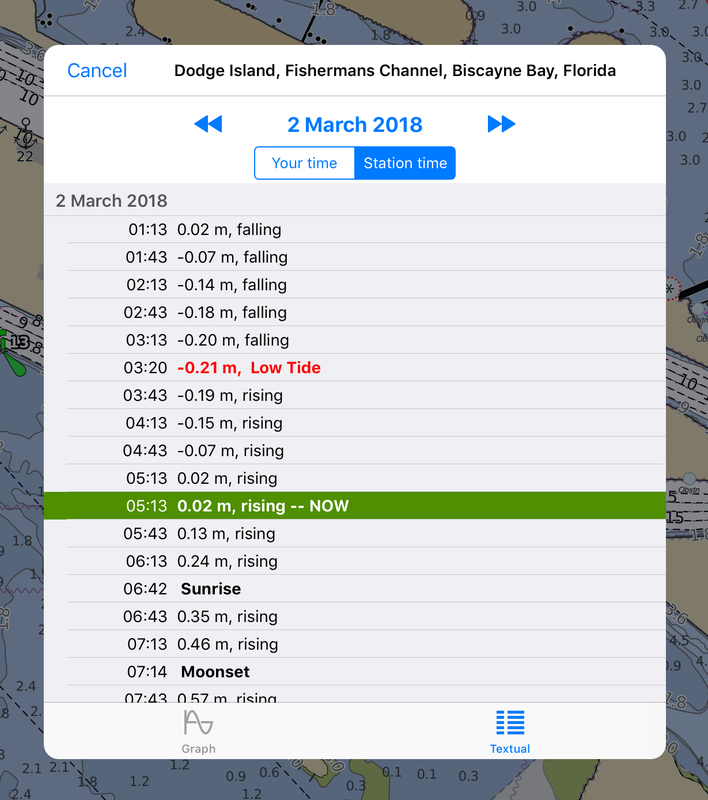 All these advantages, and much more, make this app one of the best iPhone/iPad Marine GPS application for boating, fishing and all watersports lovers. As soon as the App is installed you will be driven thru our automatic Tutorial. As soon as the App is installed you will be driven thru our automatic Tutorial. This Tutorial can be recalled anytime from the Setting page . The upper left button is the most important for Marine Navigation: it tells you if your screen is centered on the GPS position or not. In this status the screen map is NOT centered on the GPS position. This button icon will be shown everytime you pan or zoom manually. 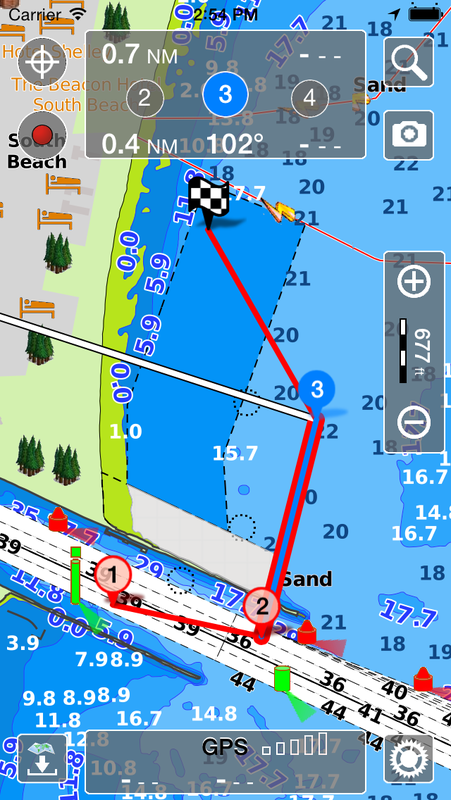 In this status the screen map is centered on the GPS position. If you want the map to follow your GPS position then this icon must be on the screen. 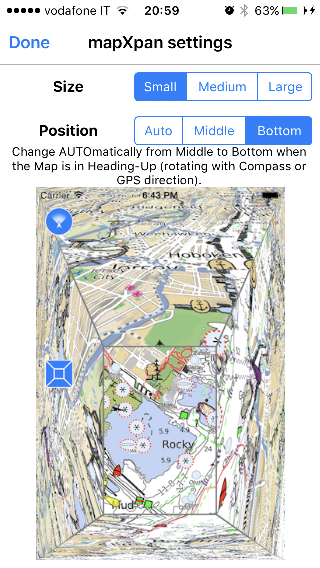 In this status the screen map is rotating on the GPS position along your direction. If you want the map to follow your GPS position while rotating with your direction, then this icon must be on the screen. 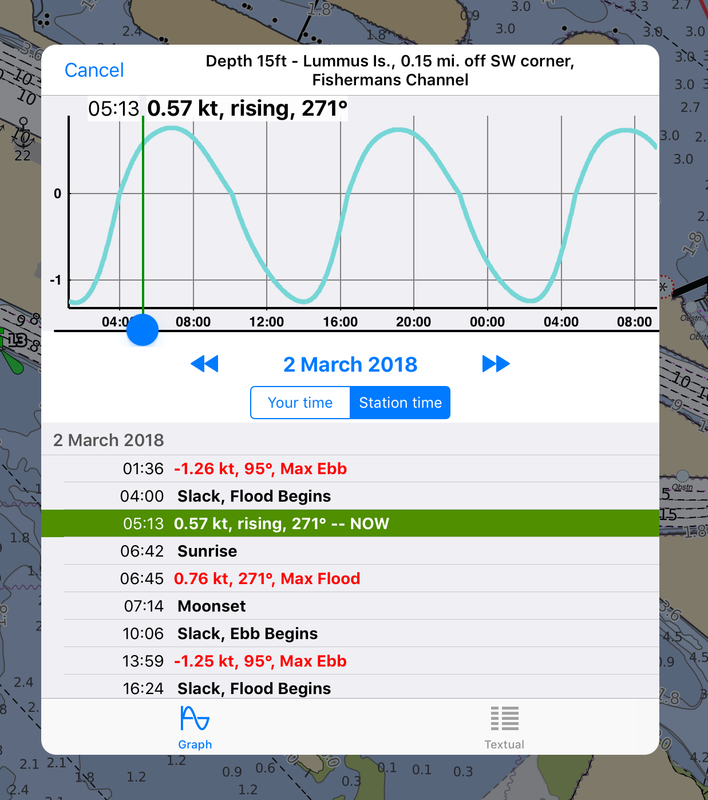 A worldwide basemap will be available as soon as the Aqua Map app is installed on your iPhone/iPad, then you will able to download the detailed Boating charts with the dedicated button. Zooming in or pressing this button , you will be able to download the most detailed maps for FREE (in your area). Tap on the tiles you want and press the Download button. Selected Blue tiles become Green when downloaded. 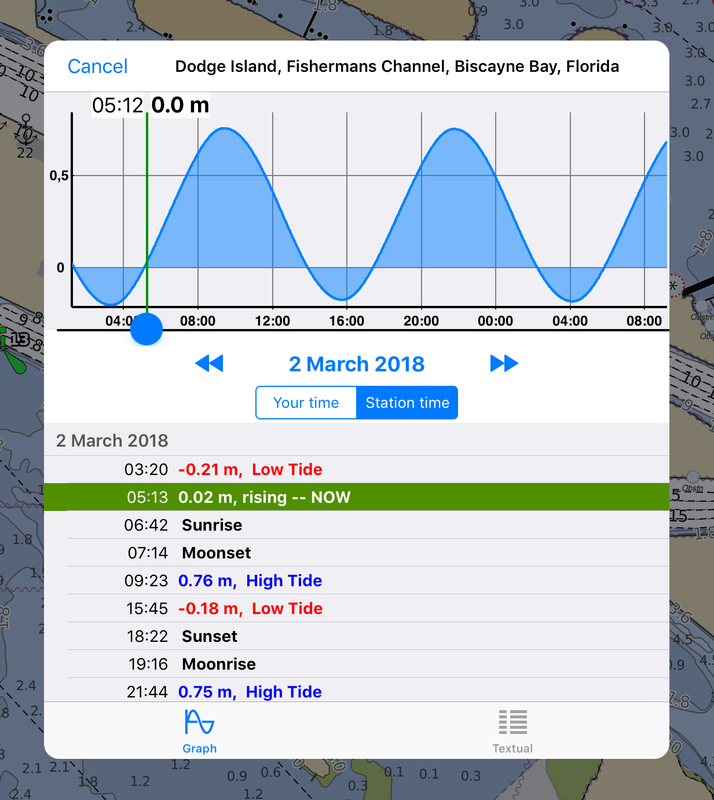 Once you downloaded detailed Boating charts, they will be resident on your device to be used offline (no internet connection required once the download is over). You can now zoom in to get the best available detail. A red dot with the number of modified tiles will appear on the Map Download icon as soon as the maps are updated. A "update" red stripe will cross the tiles should be updated. mapXpan is a new revolutionary way to display the map on the screen. mapXpan is a new revolutionary way to display the map on the screen. Run the mapXpan to extend your horizons. The mapXpan shows 64 times the coverage of your current display, mantaining the same level of detail on the focus. 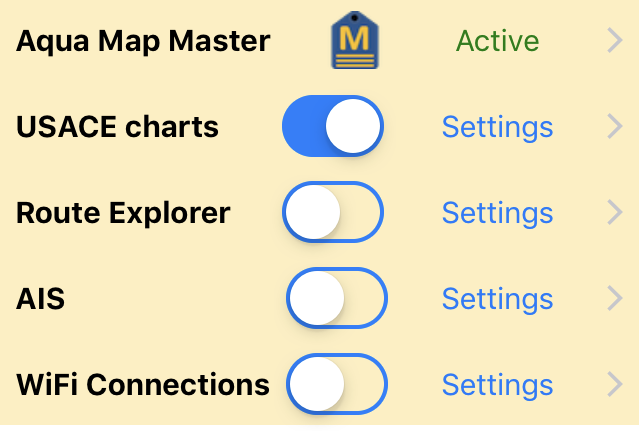 From the Settings page , or with a long pression on the mapXpan button , you will be able to configure your mapXpan for your need. Choose your detailed view size (Small, Medium, Large) and postion (Auto, Middle, Bottom). The AUTO position option will automatically switch, when the device is in rotation mode, from the Middle to the Bottom position of the plan view. This because in rotation mode the map will be oriented cursor up and so it is expected you will need more map ahead than behind your position. Click here for the full story of mapXpan exclusive function. 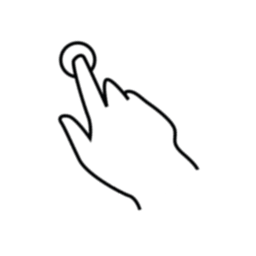 Pressing your finger on the screen for a couple of seconds will cause a Marker Pin to fall down in that position. Pressing your finger on the screen for a couple of seconds will cause a Marker Pin to fall down in that position. Tapping on the marker it will open a pop-up window where you will be able to "delete" the marker or get/modify its "info" (tapping on the marker name in the center of this dialog) or set it as starting point of a new Route. To start drawing a Route just tap on the map, it will open a pop-up window selecting the left button it will place the first Route Waypoint on the map. Add new Waypoints tapping on the map , or modify an existing Waypoint just dragging it. Add new Waypoints tapping on the map, or modify an existing Waypoint just dragging it. The Route Waypoint shows in realtime the Compass angle and the distance from the previous point. 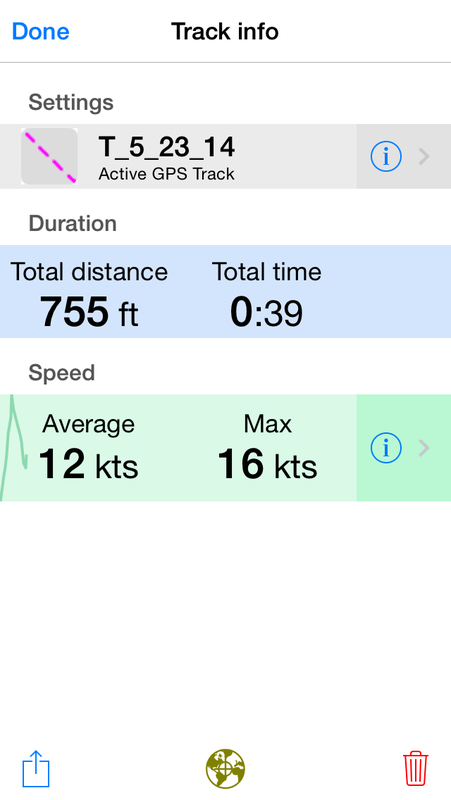 While dragging an existing Waypoint you will be able to Delete it or modify its coordinates by typing them (tap on the coordinates in the dialog to open the typing window). To add an intermediate Waypoint just tap on the Route line while editing and it will be added automatically in the tapped position. 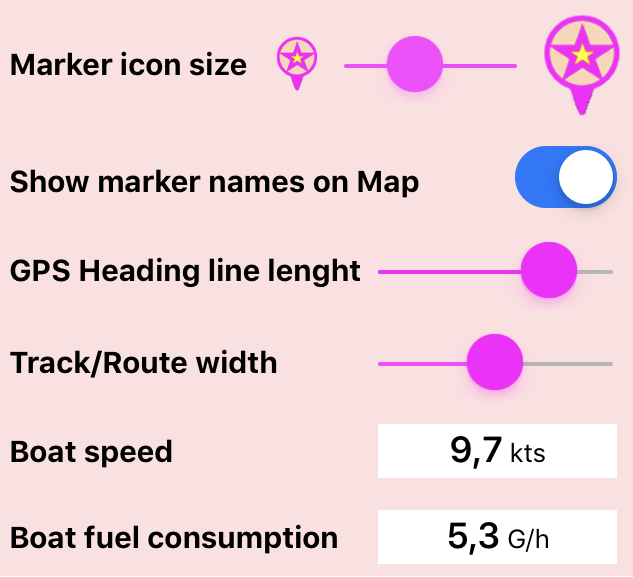 While editing you will see this window on the top side of your screen , here will see your Route lenght and estimated time (initially based on the Average Boat speed you can set up in the Setting page). Pressing the Stop Edit button you will be asked to Save or Delete the created Route. Once the Route is saved then the system will automatically make it Active and start to follow it. In the top side of your screen will appear this window . this button will put the Route in Pause. this button will make the Route Active and so the app will start following it. From these pages you will be able to modify your Route info as well as assign a dedicated Boat Fuel Consumption and Boat Speed only for this Route (while the same info in the Setting page is applied to all Routes do not have their own values set). 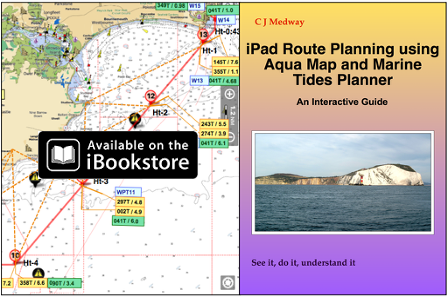 Get the new iBook by C.J.Medway with a full explanation and suggestions about the Route Planning using Aqua Map. To start record your GPS Track tap on this button ( ), it will start blinking ( ), tap again to stop and save the track log. 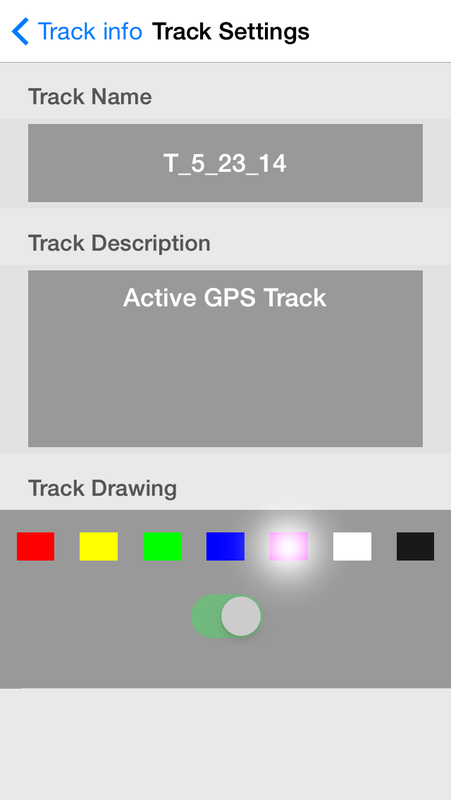 To start record your Track Log tap on this button ( ), it will start blinking ( ), tap again to stop and save the track log. Add geo-tagged Photos anytime you like. The photo will be linked to a Marker in the current GPS position. Over 70.000 POIs to make your Marine Navigation safer and relaxed. Marinas, hazards, anchorages and local knowledge all this at a finger tip. Enabling the Active Captain the first time will start downloading the database in the device for Offline usage. NOTE: the first time downloading will require some minutes, while you can continue using the app. From this page you can update the ActiveCaptain data by pressing the "Update now" button. Or you can chose one of the available automatic update options. 4 object's type are available: Marinas, Hazards, Anchorages and Local Knowledge. For each object there are different information available like name, description, opening time, etc. and the rating by other users. Just tap on an object and you will open the relative info dialog. From this page you will be able to see the various information available and add your rating and review about the selected item. Press the upper right STAR icon to enter your comment/review. Marinas, hazards, anchorages, bridges, free docks and much more to cover the entire US coastline. Enabling the Waterway Guide the first time will start downloading the database in the device for Offline usage. NOTE: the first time downloading may require some minutes, while you can continue using the app. You can update anytime the Waterway Guide database by pressing the "Update now" button. Or you can chose one of the available automatic update options. 6 object's type are available: Marinas, Hazards, Anchorages, Bridges, Free Docks and Gates. For each object there are different information available like name, description, opening time, etc. and the rating by other users. Press the upper right STAR icon to enter your comment/review (no registration/login is required. Your comment/review shall pass thru an approval process). 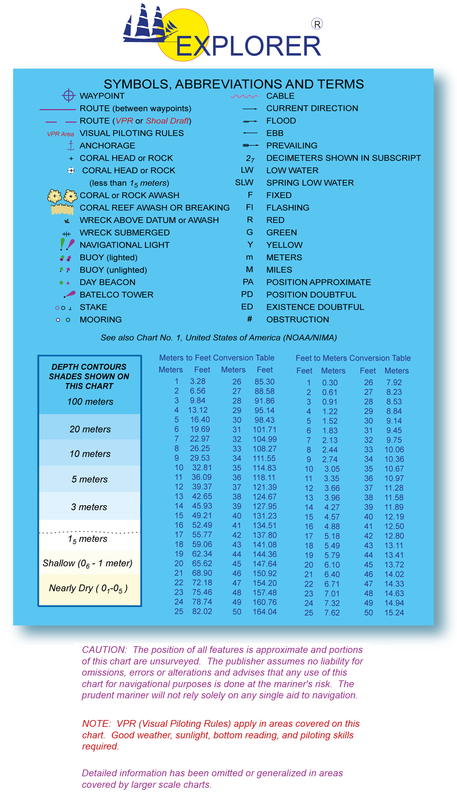 Over 5800 Tides and Currents stations in USA and around 1000 in Canada: the largest list of position where you can predict tides or currents. Great graphic experience for a realtime tide and current prediction. Everytime you will see on the screen one of these icons, a realtime Tide or Current prediction is in progress. Let's explain the meaning of the icon content. On the left you will see a rising tide of 0.3 ft, while on the right a falling tide of 0.2 ft. NOTE: sometime the number is red that means it is a negative tide. 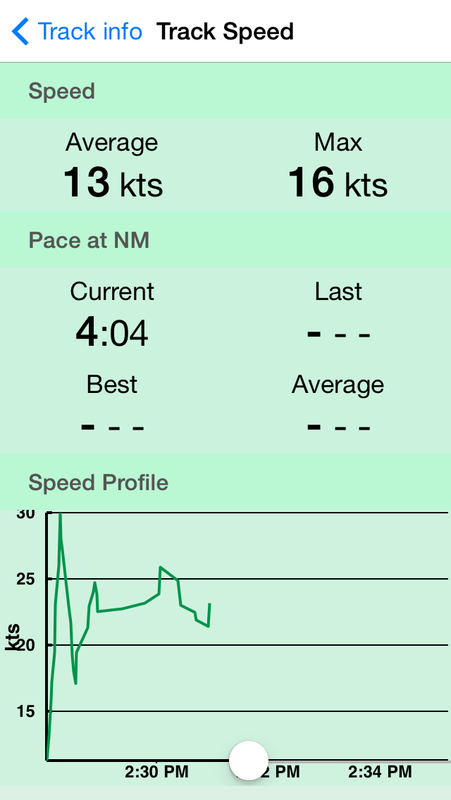 On the left you will see a rising current of 1.9 knots, while on the right a falling current of 1 knot. As far as the current icons, you may see some of them are semi-transparent . That means the current prediction is at a certain depth. - Clicking on the left icon you will start a prediction simulation over all the Tides and Currents icons on the screen. you will simulate the prediction along the selected day. You can tap on the arrows to move to the next or previous day, or you can tap on the day to select a date and time. - Clicking on the center you will access the Map Information page listing all the objects available in the tapped position. - Clicking on the right icon you will access the selected Tide or Current detailed page. This function will check in realtime your GPS position against your anchor position previously defined. An acoustic and visual alarm will run once your GPS position is out of the preferred range. 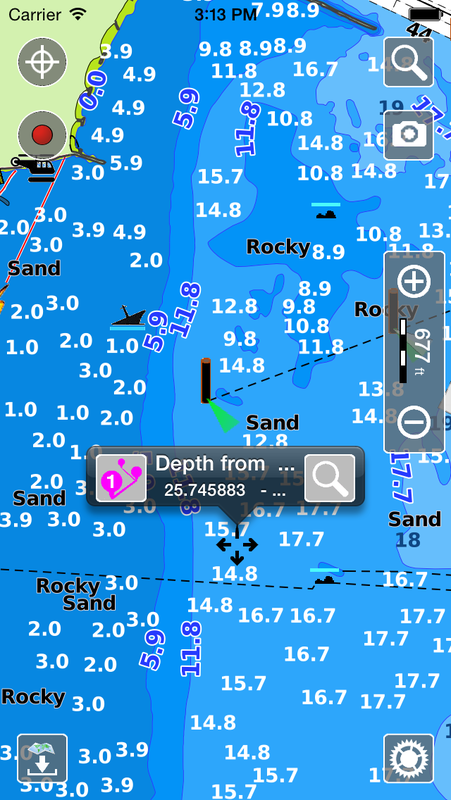 The Anchor Alarm function will check, in realtime, your GPS position against your anchor position previously defined. An acoustic and visual alarm will run once your GPS position is out of the preferred range. From the Settings page you will find the Anchor Alarm setup page. Enable Anchoring mode. First of all you will find the switch to enable/disable the Anchor Alarm. Anchor position. 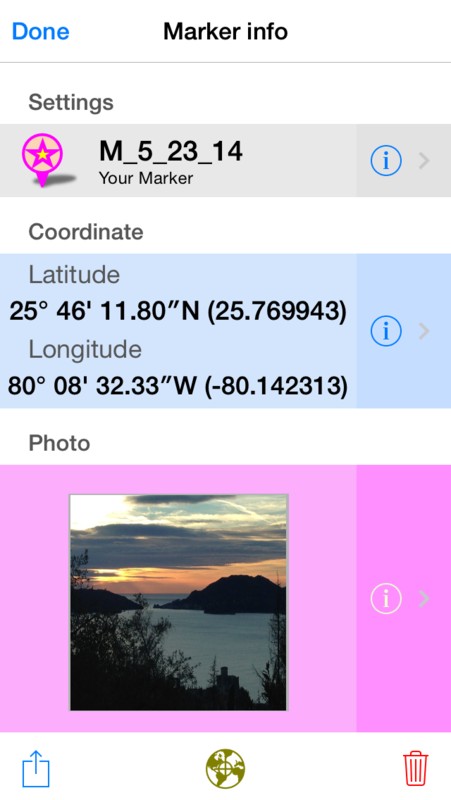 You can type coordinates or use the current GPS position. Once you set it then you can also, as a third option, go on the map, tap on the Anchor Alarm ring and drag it to the preferred position. This represents the Anchor position you want the app to calculate the distance to the app GPS device position. BE CAREFUL THIS POSITION SETUP IS EXTREMELY IMPORTANT! Alarm radius. This represents the distance, in the unit of measure you set for the app (feet or meters), between the Anchor position and your GPS device current position, out of which the Alarm will start alterting you. - Yellow, until the GPS device position is between the Warning Area and the full Circle Alarm radius. - Red, when the GPS device position is outside the full Circle Alarm radius. BE CAREFUL THIS SETUP IS EXTREMELY IMPORTANT! Alarm delay (seconds). This field sets the number of seconds to wait, once the GPS device position is outside the Alarm circle, before running both the visual and acoustic Alams. As you know the GPS position is sometimes jumping around the real position, so maybe it is worth to wait a bit before raising the Alarm. Anchorage tracking. 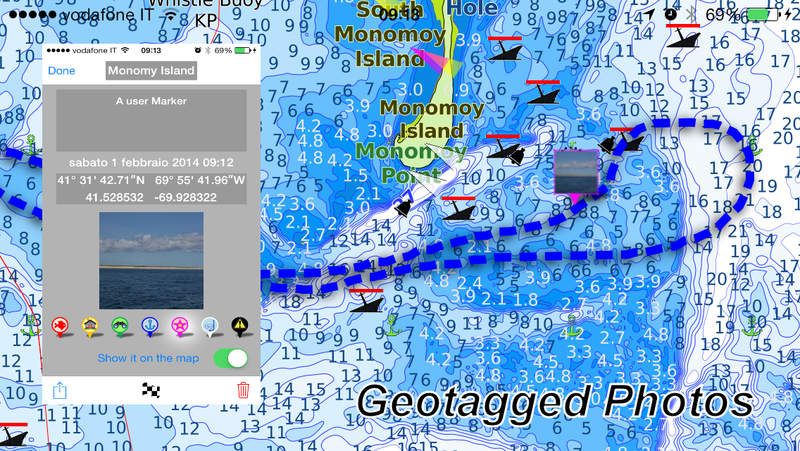 This feature will permit to track the GPS position for the whole period you enabled the Anchor Alarm. This is very helpful after a whole night of track recording, in order to learn and fine-tune the Anchor Alarm setup as you prefer. Background power save. REMOVED FOR SAFETY REASONS. We strongly suggest you, especially during the night, to plug-in the smartphone to a power socket in order to avoid battery consumption. Alarm volume. Better set it to the max. Distance alarm. Enable this to run an alarm when your GPS device position is outside of the Alarm circle. Low battery alarm. Enable this to run an alarm when your GPS device is battery low. GPS quality alarm. Enable this to run an alarm when your GPS position quality is low. The Anchor Alarm is a very important feature in the GPS navigation, as well as it is the attention the Captain shall put in its use. The setup of this function has been reduced to the minimum but also left enough flexible in order to obtain the best user-experience possible. Remember to check our Disclaimer. 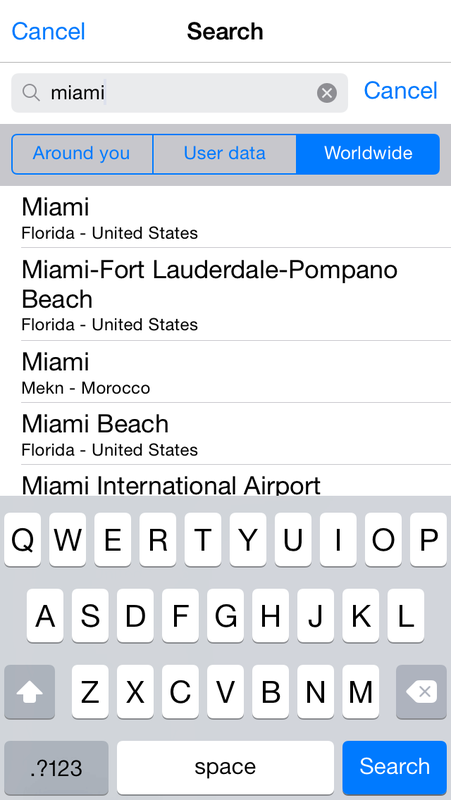 We have implemented 5 Search types: Around you, User Data, Worldwide, map tap, go to. Around you..... Selecting this will search any chart objects in a range around your GPS position. User data........ Will search Routes, Tracks and Markers. Here you can also download user data from your GEC Account. Once you logged in to your GEC Account you will be able to select a file from your archive and load it into the Aqua Map App. Worldwide....... This function can search locations in a worldwide database (only online). 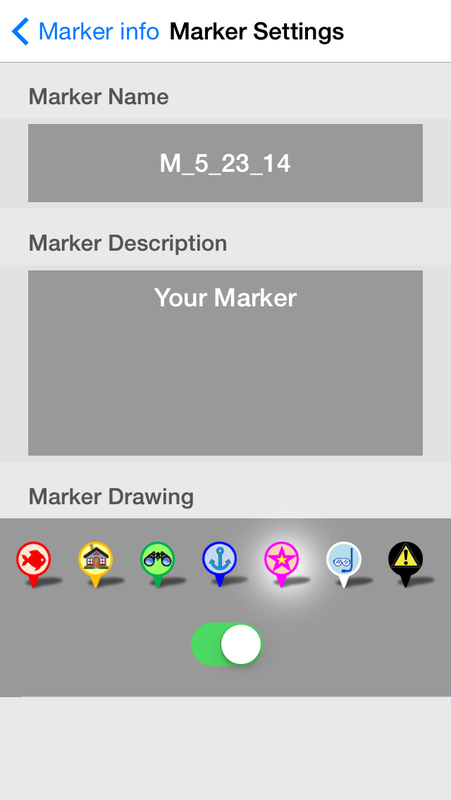 Tapping.......... on the Map you will be able to Search any chart object in a range around the tapped position. Go To ............ tapping on the map and then on the search button you will be able to type precise latitude and longitude coordinates to move to. Tapping with two fingers on the map will open the Distance tool. Tapping on the distance icon you will be able to switch on/off this function. 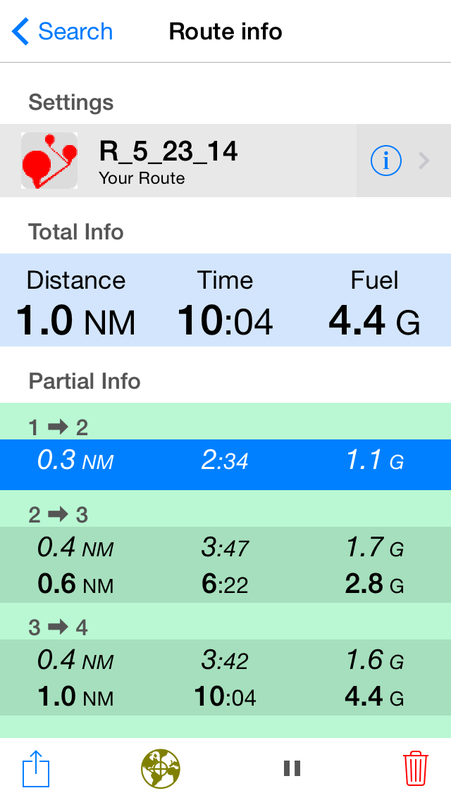 You will be able to drag the starting or ending points and automatically calculate the distance between the two. All Routes, Photos, Markers and Tracks can be shared with other devices, friends and communities by clicking this button . 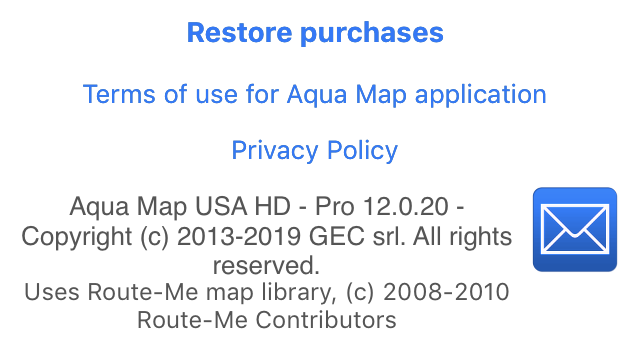 Connect now your Aqua Map App with your GEC Account. With this new function you will be able to store your Markers, Tracks, Photos, Routes and all marine experience on your Account to be reviewed at home with friends, or just to be archived to save space on your smartphone, or plan your next trip drawing your own itinerary. Improve your Marine Sharing experience. Click here for more information about the GEC Account. This button will enter the Setting page. The Settings page is becoming more important the more functions are added into the Aqua Map. The settings are grouped by type to improve the readability. At the top of this page you can find a link to the Help (online), that corresponds this current website page, and a small Tutorial to describe the main gestures applicable to the Aqua Map application. The first group is regarding the map major feature display. Map style This function, working only in case of vector data not for raster, is able to switch the cartography between a Standard "Chart Like" vs a Colorful visualization. Land data This function, working only in case of vector data not for raster, is able to switch ON/OFF the land part of the map (full road network, elevation contours, etc.) or fade it with a 35% transparency to highlight the marine part. Online satellite images This function enables the visualization of satellite images (online only). In case of vector data the satellite will be shown only on the land part. 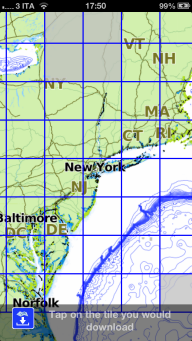 A slider will be available on the map to fade the cartography (both vector and raster). 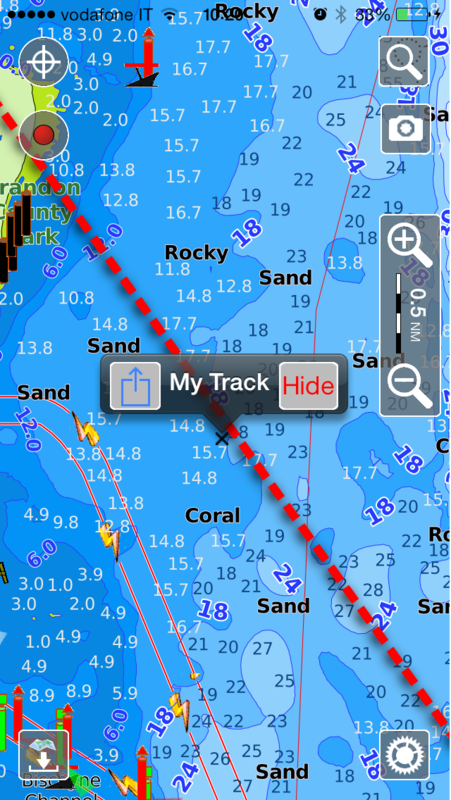 Tides & Currents display This function switches ON/OFF the Tides and Currents stations, where available, from the map. Special Charts This function switches ON/OFF the Special Charts from the map. Currently the only Special Charts available are the Italy Fishing maps. Charts store Here you can find listed the Charts you already acquired and those can be inApp purchased from this app. From this setting you can also restore your previously purchased charts. The next group is regarding the new Aqua Map Master product. Aqua Map Master This item shows the status of your Aqua Map Master. If "Active" it means this product is currently available, otherwise you will see written "Upgrade" that means your Master subscription must be activated. USACE Surveys The switcher enables or disables the overlay of the USACE Surveys data on the map. For the Settings part please check the USACE Surveys details here. Route Explorer The switcher enables or disables the visualization of the Route Explorer data from the map and the route detail page. For the Settings part please check the Route Explorer details here. AIS The switcher enables or disables the overlay of the AIS data on the map. For the Settings part please check the AIS details here. WiFi Connections The switcher enables or disables the WiFi connections. For the Settings part please check the WiFi Connections details here. The next group is related to the standard functionalities. Safety depth Here you can type your safety depth. 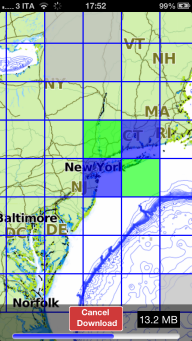 This value will define the limit of the blue shaded depth areas. Depth areas deeper than the "Safety depth" are white shaded. This is working only for vector data. 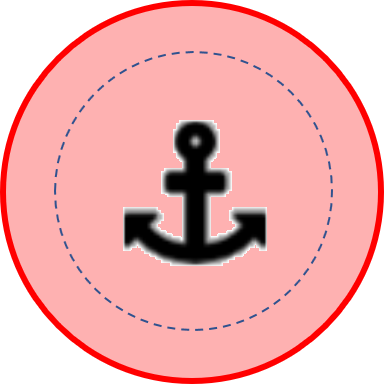 Anchor alarm The switcher enables or disables the Anchor Alarm functionality. For the Settings part please check here. mapXpan The switcher enables or disables the mapXpan functionality. For the Settings part please check here. The next group is related to the Accounts. GEC Account The GEC Account is the official Aqua Map server where you can archive your "User data" (Routes, Markers, Tracks) and organize it thru the GEC Account Manager. The GEC Account is also where all your app purchases are stored, so you will be able to share them for free with up to 5 different devices (both iOS or Android), check here for more details. Active Captain The switcher enables or disables the Active Captain data overlay on the map. For the Settings part please check here. 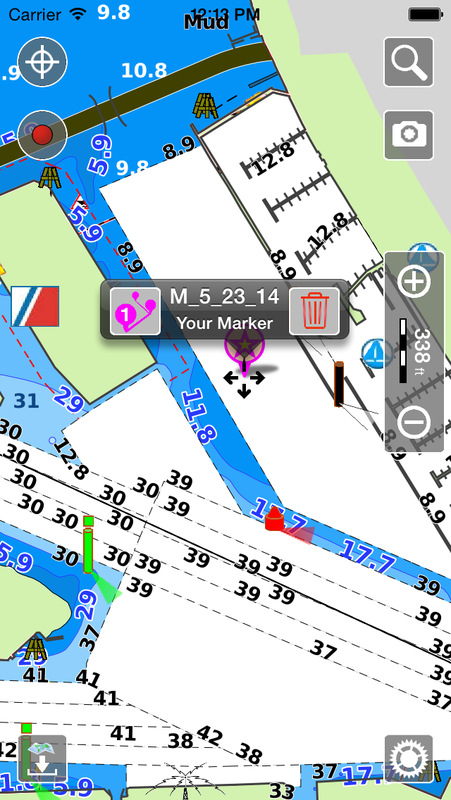 Waterway Guide The switcher enables or disables the Waterway Guide data overlay on the map. For the Settings part please check here. The next group is related to the general application settings. Depth unit This function sets your preferred depth unit of measure between meters and feet. In case of map data it works only with vector format not raster. Distance unit This function sets your preferred distance unit of measure between Nautical Miles, Kilometers and Miles. In case of map data it works only with vector format not raster. Fuel unit This function sets your preferred fuel unit of measure between gallon and litre. Coordinates format This function sets your preferred coordinates format between DMS.s (Degrees Minute Seconds and fraction of second) and DM.m (Degrees Minutes and fraction of minute). Compass heading This function sets your preferred compass reference between Magnetic and True. ... continue the general application settings. Marker icon size Here you can chose the Marker icon size you prefer just moving the slider. Show marker name on map This function enables or disables the display of the Marker name on the map. GPS heading line lenght Here you can control the length of the heading line displayed with your boat position along the direction you are following. Track/Route width Here you can control the width of the Routes and Tracks on the map. Some people prefer to have tick routes on the screen while sailing. Boat speed Here you can set your average favorite speed to be used by the app while calculating the route planned timing. 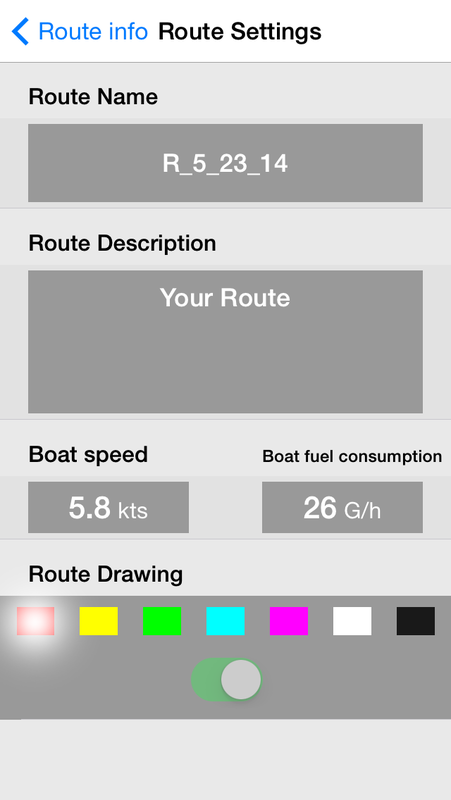 Boat fuel consumption Here you can set your average fuel consumption to be used by the app while calculating the route planned fuel consumption. Sounds effects This function enables or disables the typing sounds effects. This switch has no impact on the Anchor Alarm sound. UI Animation effects This function enables or disables the UI animation effects applied while opening and closing windows. Buttons Auto-Hide This function enables or disables the Auto-Hide of buttons on the map. Disable Auto-Lock (the device will never lock) If you enable this function then the device will never lock. Downloaded Maps Pressing the RESET button you will remove ALL the downloaded tiles map from the device. Remember you can remove tile by tile from the download page. 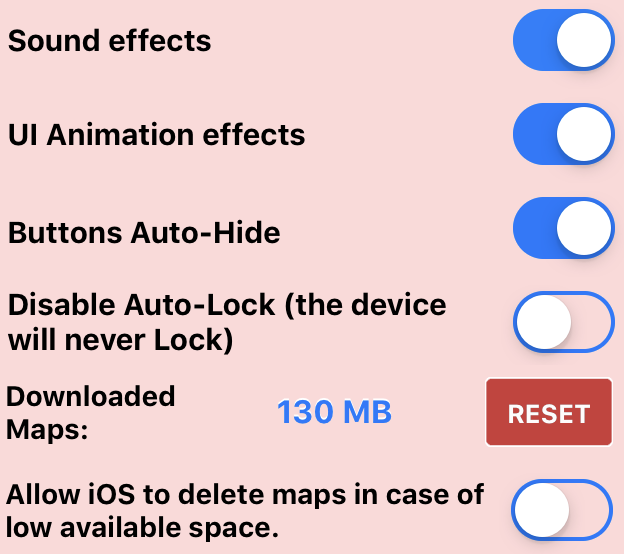 Allow IOS to delete maps in case of low available space If enabled, this function lets iOS decide to remove map tiles you downloaded in the device in case of low memory space. Here you will find also the Aqua Map product name, version and various copyright aknowledgments. 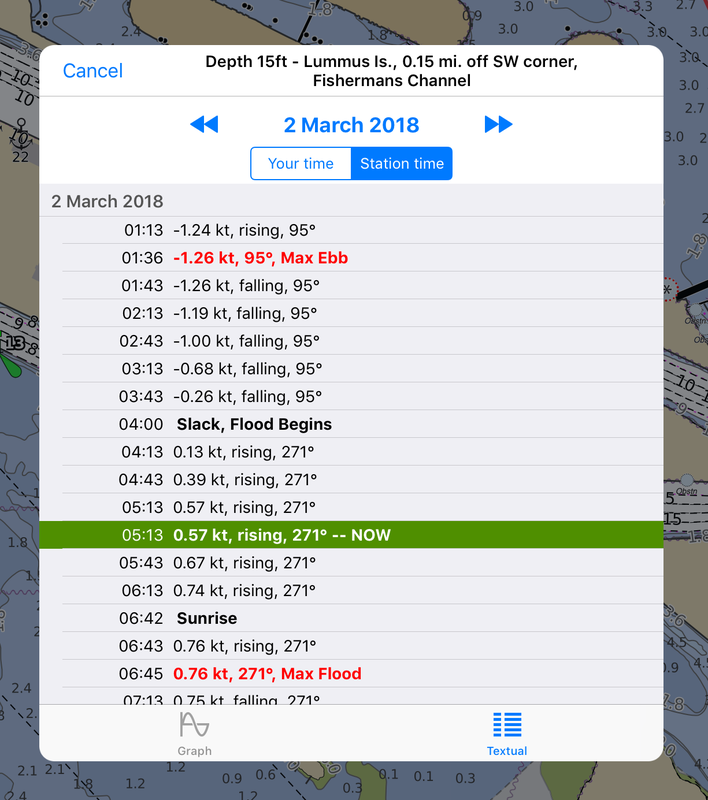 The Aqua Map app provides to the user an amazingly clear Nautical Chart using the full power of the Retina display, with intuitive realistic symbols and colors. Click one of the two images to check the complete legenda of Symbols for Colorful or Standard presentation, used into the Aqua Map products. 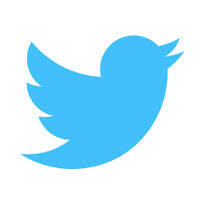 Click on the Explorer image to enlarge its legend of symbols.